Although I suspect that Rock of Ages won't be helped by word of mouth, once it starts to get around, it should work in its favour that it's essentially critic-proof- another celebrity karaoke session in the vein of Mamma Mia, and you've already decided if you want to see it or not. Nevertheless, here's my rebuttal. From Hairspray director Adam Shankman, this one takes place in 1987, on LA's Sunset Strip. Oklahoma girl Sherrie arrives with stars in her eyes, and a whole bunch of hair rock songs in her heart. She's helped out by Drew, a barman at the infamous Bourbon Room. The club is on the ropes, and its future is staked on legendary rock star Stacee Jaxx, who's about to go solo, and Sherrie and Drew have to find their own way to fame and fortune. So, it's about a small town girl, and a city boy, and it goes on and on and on and oooon. Do you see where this is going? If you blanched at that, imagine how you'll feel at the numerous feed lines, which tend to precede each and every number in the movie. Hell, I think there's only about ten minutes of dialogue in the film's two hour running time. It's not that it's over-long- musicals have to be a bit long, because musical numbers take time. It helps when musicals have proper plots though, too. Julianne Hough and Diego Boneta are winsome leads, though straight out of the Glee mould. There's a lot that comes from that show's success, for a film that makes so much noise about how the true spirit of rock is under threat from The Man, here epitomised by Paul Giamatti as Jaxx's effortlessly slimy manager, and Catherine Zeta Jones as a Helen Lovejoy surrogate who has beef with the Bourbon Room's legendary decadence. Basing a film, on a Broadway musical, on the “plot” of Don't Stop Believing, isn't so much an act of reclamation for that song, as it is a bit of a cash-in. I thought that my expectations were entirely realistic, after seeing the rousing, unapologetically cheesy trailers and marketing, but there wasn't really much fun to be had here. There are highlights, of course- I'm still not sure if the duet between Alec Baldwin and Russell Brand is a stroke of campy genius, or the film's nuke-the-fridge moment. As has been forecast by other critics, the best scene is another duet, which sees Tom Cruise and Malin Ackerman singing “I Wanna Know What Love Is”, which is perhaps the one scene that stops skirting around the so-called decadence in a 12A fashion, and actually digs into something more risqué and lusty. It's with a Herculean effort that Cruise consistently makes the film watchable. For all of that gubbins about his popularity declining, he's still able to carry a musical, even if he can't always launch an action movie, and it's the versatility of his eerie brand of charisma that cements his enduring movie star appeal. 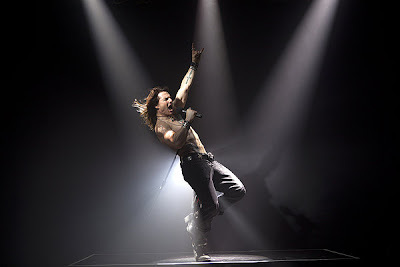 Stacee Jaxx is far from his best ever performance, and you can't rely on Cruise to make the flat script any more zingy, but he certainly belts out karaoke rock anthems with the best of them. Whatever you liked about Hairspray, it's not really present in Rock of Ages, a film whose supposed B-plot, with Catherine Zeta Jones and the club's financial troubles, is really the only plot. Though Shankman deserves credit for getting such committed performances from the cast, but it's a shame that their enthusiasm seems to desert them when they're not singing. One of the big numbers is a mashup with Starship's “We Built This City On Rock And Roll”. Weighed down by leaden dialogue and choppy pacing, here's a film that feels more like it's playing corporation games, whatever the hell that means. Rock of Ages is now showing in cinemas nationwide. If you've seen Rock of Ages, why not share your comments below? Those fools! Don't they know that we've already seen 2012's best cinematic use of "We Built This City On Rock And Roll"?